The Hawthorn tree in our garden looks very scruffy in winter. But in May when it blooms, its one of the prettiest in our garden. This tree is also know as May tree for that reason. The tree is often used as hedges around England because of its thorns. They are very thorny. And the thorns are not aways easy to spot. I also find it very attractive the way the tree leans. Completely the opposite to the Cordyline which looks unnaturally straight. I always loved this tree since I moved in, but only recently I found out about its history. The Hawthorn is also called the bread and cheese tree. Why the name? It turns out that in the old days the leaves were eaten and referred as bread and cheese. It doesn't stop here - if you search for Hawthorn on youtube or google you will find that the Hawthorn is also famous in medicine. The berries, leaves and flowers are good for the heart and circulation. This spring I already have a plan. I will eat the young leaves and make a tea out of the blossoms. Obviously I will definitely write about the experience. 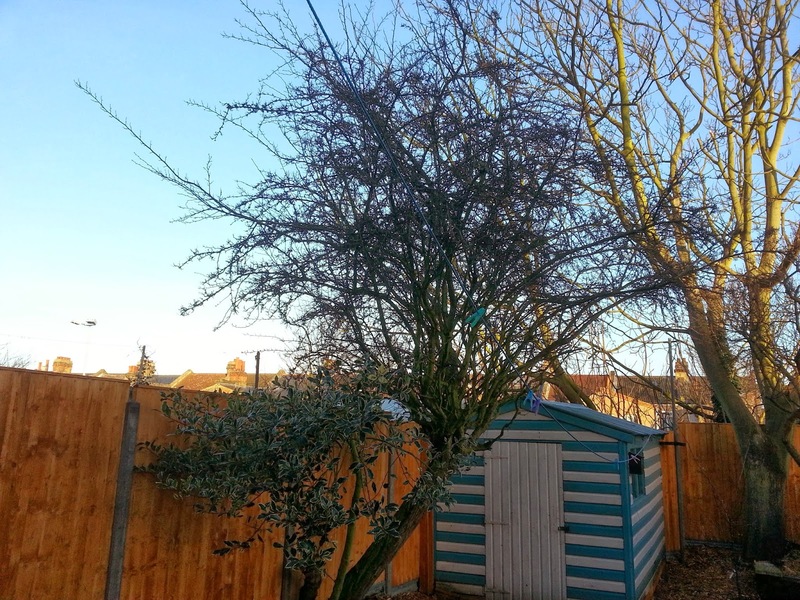 The picture below shows how the Hawthorn looks now in winter.